For other people named Larry Smith, see Larry Smith (disambiguation). Larry Smith (September 12, 1939 – January 28, 2008) was an American football player and coach. He served as the head football coach at Tulane University (1976–1979), the University of Arizona (1980–1986), the University of Southern California (1987–1992), and the University of Missouri (1994–2000). In Smith's 24 seasons as a head coach, his teams were 143–126–7. Smith was a native of Van Wert, Ohio, where he was a three-sport star at Van Wert High School, graduating in 1957. He earned an appointment to West Point, but transferred to Bowling Green State University a year later to pursue coaching. He played two-way end at for the Falcons, playing on a small-college national championship team as a sophomore in 1959; he won all-league honors as a junior and was team captain as a senior. Smith graduated from Bowling Green in 1962 with a Bachelor of Science in Mathematics, and later earned a Master of Education from Bowling Green in 1967. Known as a defense-oriented, no-nonsense coach, Smith began coaching as an assistant with Shawnee High School in Lima, Ohio for two seasons (1962–63) and then head coach the next three years (1964–66). In 1967, he joined Bo Schembechler's staff at Miami University, serving as defensive end coach for two seasons. He moved with Schembechler to Michigan, serving as offensive line coach for four seasons (1969–72). When fellow assistant coach Jim Young (Also a native of Van Wert, OH and high school football teammate) was hired as head coach at Arizona, Smith moved with him and served as the assistant head coach/defensive coordinator there for three years (1973–75). After the departure of Bennie Ellender, Tulane hired Smith as the head coach in 1976. His first team went 2–9, then improved over the following years to 3–8 and 4–7. Smith's Green Wave teams experienced a break-out year in 1979: Tulane opened the season defeating #13 Stanford and later defeated #19 SMU. In the regular season finale, Tulane defeated rival LSU, 24–13, in the Louisiana Superdome; the crowd of 73,496 remains the highest attendance to see the Green Wave play at the Superdome. Tulane ended the regular season with a 9–2 record, ranked #15 and was invited to play in the 1979 Liberty Bowl. Its first bowl game in six years, Tulane lost to Penn State, 9–6, but Smith's ability to finish the season 9–3 attracted attention and he was hired away by Arizona. Smith's tenure with Tulane ended with a 17–27 record. Under his guidance, ten Tulane players earned All-America honors, including two-time All-Americans quarterback Roch Hontas and kicker Eddie Murray as well as offensive tackle Eric Laakso and tight end Rodney Holman. Six of his Tulane players entered the NFL. Smith arrived at Arizona in time for the 1980 season, the Wildcats' third season in the Pacific-10 Conference (along with rival Arizona State [ASU], they had joined the former Pacific-8 in 1978). Smith put great emphasis on in-state recruiting, built up the rivalry game with ASU, and focused the team on what he called "running and hitting". His first team went 5–6, including a 44–7 blowout loss to ASU; it would be his only losing season at Arizona. The highlight of the season was a 23-17 upset of 2nd ranked UCLA (the Bruins were poised to become #1 as top ranked Alabama had lost earlier in the day). The team improved to 6-5 during his second season, highlighted by a major 13–10 upset of #1 USC on the road. Under his leadership, the Wildcats became competitive in the conference, began dominating the rivalry with the Sun Devils, and culminated with consecutive bowl appearances, in the 1985 Sun Bowl, where a tie with Georgia gave the Wildcats an 8–3–1 record, and the 1986 Aloha Bowl, where a victory over North Carolina allowed the Wildcats to finish with a 9–3 record in his final season. Smith's tenure with the Wildcats ended with a 48–28–3 record. Seven Arizona players earned All-America honors during his tenure, including two-time consensus All-American linebacker Ricky Hunley and All-Americans linebacker Lamonte Hunley (Ricky's younger brother), Morris Trophy-winning center Joe Tofflemire, safety Allan Durden, placekicker Max Zendejas, linebacker Byron Evans, and safety Chuck Cecil. Over twenty of Smith's Wildcats players went on to play professionally. After success at Tulane and Arizona, Smith was hired as USC's first coach without previous Trojan ties since Howard Jones in 1925. His tenure at USC started strong as his first three Trojans teams went 27–8–1, won a then-school-record 19 consecutive Pacific-10 Conference games, earned three consecutive conference titles from 1987 to 1989, and went to three consecutive Rose Bowls. Smith's 1988 team was arguably his most successful. With Rodney Peete at quarterback, the Trojans started their season 10–0 and defeated #3-ranked Oklahoma and #6-ranked UCLA. USC's Rose Bowl berth-clinching win over UCLA that year was its first-ever against the Bruins in Pasadena since they moved to the Rose Bowl in 1982. Smith's USC team entered their final regular season game ranked #2 against the #1-ranked rival Notre Dame; the Fighting Irish defeated the Trojans, 27–10, en route to a national title. The Trojans went on to play in the Rose Bowl, losing to Michigan. His 1989 team went 9–1–1 in the regular season and beat Michigan in the 1990 Rose Bowl to avenge the previous year's loss. Smith's next two Trojans teams were not as successful, losing the John Hancock Bowl (now Sun Bowl) in the 1990 season followed by a difficult 3–8 1991 season that began with a major upset loss at home to unheralded Memphis State. The 1990 season was marked by a strained relationship with quarterback Todd Marinovich, culminating in a heated verbal barrage on Smith in full view of a national TV audience during the 1990 bowl loss and Marinovich getting arrested for cocaine possession a month later; Marinovich soon left for the NFL after his sophomore year. After the 1990 season three players were arrested on charges of sexual assault (and later acquitted), and after spring practice there were the arrests and subsequent convictions of two players in a kidnapping-robbery spree. The 1991 season itself was only the third time the Trojans had had a losing season in over thirty years. The 1992 season proved to be Smith's undoing with USC. The Trojans had a disappointing 6–4–1 regular season that included a 31–31 tie with San Diego State (a game in which the Aztecs' Marshall Faulk shredded the USC defense for over 250 yards), a 31–23 loss to intersectional rival Notre Dame, and a gut-wrenching 38–37 loss to archrival UCLA. The then #23-ranked Trojans accepted a berth in the 1992 Freedom Bowl, a lower tier bowl game in Anaheim, California, against an unranked Fresno State team in the first match between the two programs. Despite being heavy underdogs, the Trent Dilfer-led Bulldogs won in a 24–7 upset victory that angered many USC supporters. Smith caused further furor after the game in declaring that "Names and logos don't mean anything. You don't beat someone just because of your name and logo." Within days of the Freedom Bowl loss and his commentary, Smith was fired by USC with three years left on his contract. Smith finished with a 44–25–3 record at USC, 17–17–2 in his final three seasons. During his tenure he coached 13 All-American first teamers, including Heisman Trophy-runner-up Rodney Peete, Thorpe Award-winning safety Mark Carrier, linebacker Junior Seau, wide receiver Curtis Conway and defensive tackle Tim Ryan. Thirty-three of his USC players were selected in the NFL Draft, six in the first round. After a year away from coaching, Smith was hired before the 1994 season as the 30th head coach of Missouri, replacing Bob Stull, who had been reassigned as assistant athletic director after five losing seasons. His first two Tigers squads went 3–8–1 and 3–8, however they improved to 5–6 in 1996. The 1997 Tigers finished with a 7-4 regular-season record, Mizzou's first winning season since 1983, and were invited to the 1997 Holiday Bowl, where they were defeated by Colorado State, 35–24. The Tigers had another 7–4 regular season in 1998, and were able to cap it with a win in the 1998 Insight.com Bowl against West Virginia, 34–31, to end the season 8-4 and ranked #21 in the final AP Poll. The 1997-98 seasons marked Mizzou's first back-to-back bowl games since 1980-81 under Warren Powers' tenure. Smith was rewarded at the end of the 1998 regular season with a new five-year contract that raised his salary from $161,500 to $180,000 annually; he had become one of just four coaches in NCAA history to take four schools to bowl games. The Tigers followed their two bowl seasons with two losing seasons that featured a number of blowout losses. The 1999 squad went 4–7, gave up a 21–0 shut-out loss to rival Kansas, and ended the season with three straight blow-out defeats of 37–0 to Oklahoma, 51–14 to Texas A&M and 66–0 to Kansas State. Smith's 2000 Tigers did not fare better, losing to Clemson (62–9), Texas (47–12) and rival Kansas (38–17) on their way to a 3–8 season. Smith was fired on November 18, 2000 immediately after the final game of the season, a 28–24 loss to Kansas State. During his tenure at Missouri, the team compiled a 33–46–1 record. After his coaching career ended, Smith moved back to Tucson and worked as a commentator for Arizona football games on Fox Sports Net, and organized weekend instructional camps twice annually. He also voted in the Harris Poll, part of the Bowl Championship Series equation. He was diagnosed with chronic lymphocytic leukemia in 1999, which would ultimately claim his life. He died in Tucson on January 28, 2008. Smith was married to Cheryl (née Nueenschwander); they had a son, Corby, a daughter, Alicia, and several grandchildren. Corby Smith played at quarterback for both USC and Iowa, graduating from the latter in 1995 and immediately joining his father on the coaching staff of Missouri. ^ Finley, Ryan. "Former UA coach Larry Smith dies", Arizona Daily Star, January 28, 2008. 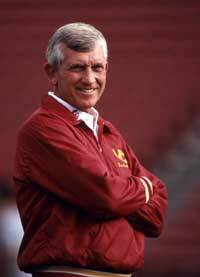 ^ a b c d e Former USC Head Football Coach Larry Smith Dies, USCTrojans.com, January 28, 2008. ^ Bio: Larry Smith, Mizzou Athletics website, Accessed January 30, 2008. ^ a b Tulane Yearly Results: 1975-1979 Archived February 3, 2008, at the Wayback Machine, College Football Data Warehouse, Accessed January 30, 2008. ^ a b c Former Football Coach Larry Smith Dies At Age 68 Archived January 31, 2008, at the Wayback Machine, TulaneGreenWave.com, January 28, 2008. ^ a b c d Jerry Crowe, Larry Smith, 68; led USC to Rose Bowl three times, Los Angeles Times, January 29, 2008. ^ a b c d USC Football History, 2006 Football Media Guide. ^ Mal Florence, Memphis State Didn't Buy USC Mystique : Tigers: Stobart had his team ready to face the music in the Coliseum, Los Angeles Times, September 3, 1991, accessed August 2, 2013. ^ Richard Hoffer, Where Are The Good Old Days?, Sports Illustrated, August 31, 1992, Accessed September 10, 2008. ^ a b SPORTS PEOPLE: FOOTBALL; Coach for Missouri, The New York Times, December 16, 1993. ^ Reaction To Death Of Former Coach Larry Smith, MUTigers.com, January 28, 2008. ^ a b c Missouri Yearly Results: 1995-1999, College Football Data Warehouse, Accessed February 10, 2008. ^ 1998 final AP poll, STASSEN.COM College Football Information, Accessed February 10, 2008. ^ Missouri Yearly Results: 1980-1984, College Football Data Warehouse, Accessed February 10, 2008. ^ FOOTBALL: COLLEGE ROUNDUP, The New York Times, December 19, 1998. ^ FOOTBALL; Missouri Coach Out After 3-8 Year, The New York Times, November 20, 2000. ^ Crowe, Jerry (July 16, 2006). "Seeing Bright Side of Life, and USC". Los Angeles Times. ^ Bio: Corby Smith, Mizzou Athletics website, Accessed January 30, 2008.